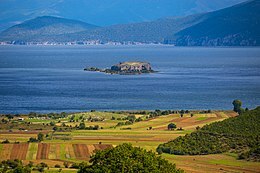 Maligrad or Qyteti i Vogël is an island situated deep within the Albanian part of Lake Prespa, with many caves suitable for wildlife and a circular cliff. Shaped like a tadpole, it contains some trees and an area of sand. The island contains a famous Saint Mary Church, built by Kesar Novak (Qesar Novaku), a local noble, in 1369. It has an area of almost 5 hectares. ^ Gillian Gloyer (2012). Albania. Bradt Travel Guides. pp. 139–. ISBN 978-1-84162-387-0. ^ Anamali, Skënder (2002). Historia e popullit shqiptar në katër vëllime (in Albanian). I. Botimet Toena. pp. 294–295. OCLC 52411919. This article about a specific location in Korçë County, Albania, is a stub. You can help Wikipedia by expanding it. This page was last edited on 19 November 2018, at 19:54 (UTC).